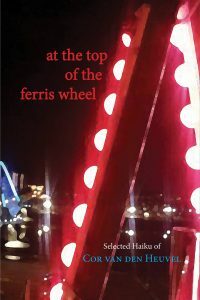 The Haiku Foundation announces its third publication, At the Top of the Ferris Wheel, selected haiku of ELH pioneer Cor van den Heuvel. At the Top gathers into one place all the Chant Press chapbooks, along with many collections printed by other small presses, the haiku from Cor’s book of childhood haibun, A Boy’s Seasons, and more. This sumptuous 300+ page collection was designed and produced for The Haiku Foundation by Red Moon Press, and is the most complete record of van den Heuvel’s poetic accomplishments available. The only way you can get a copy of this terrific collection is by donating to The Haiku Foundation. The work of all those involved in the project has been donated to the advancement of the Foundation, to create an incentive premium unique to us. Donate $30 or more to The Haiku Foundation.